Poachers lace the butchered animals with poisons such as strychnine, organophosphate and aldicarb, commonly known as “two-step” because animals literally take only two steps before they die. The vulture situation in southern Africa is like many other wildlife stories – safe environments are becoming fewer, and their numbers are rapidly declining. Scientists estimate that, if current trends continue, the Cape vulture – which is endemic to southern Africa – will have declined by 98% in the next three generations. The Cape vulture is virtually extinct in Namibia and does not occur as abundantly as it once did in Botswana. In the Eastern Cape of South Africa, a previous hotspot for Cape vultures, it would be surprising if there are 500 breeding pairs left. Poisoned elephant carcasses killed at least 476 vultures in Zambia in October 2013, and in Zimbabwe close to 500 vultures have been killed in ivory poaching incidents in recent years. Poachers also take advantage of the financial gain that dead vultures can bring them. Vulture parts are used in so-called traditional medicine, so poachers seize the opportunity to decapitate vultures at a poaching site to sell their heads to the muti industry. The heads are supposedly used in divination. 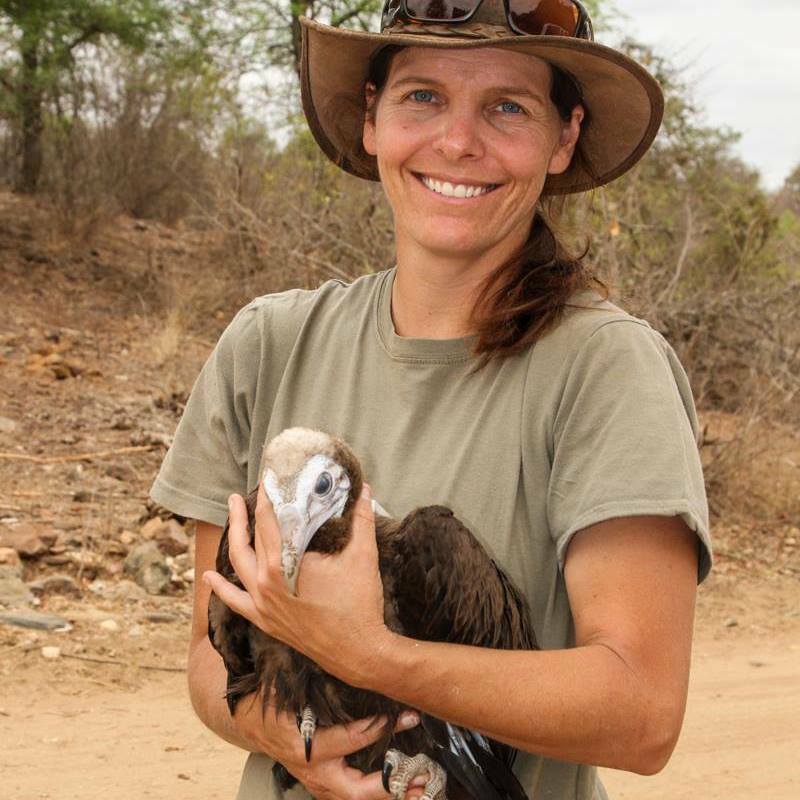 “We are concerned that, as the market increases, the demands will escalate and more people will see the financial gain a dead vulture can bring,” said Kerri Wolter from VulPro, an organisation dedicated to vulture conservation, research, education, captive breeding for release and rehabilitation in southern Africa. One reason for the decline is poisoning. If illegal poisoning continues, vulture populations will follow rhinos on the route of steep decline, said Gerhard Verdoorn of the Griffon Poison Information Centre. Across Africa, close to 6,000 vultures have been recorded poisoned since the 1980s, according to a recent survey released by the international Peregrine Fund. Not all deaths are reported, so numbers are likely to be much higher. In one recent incident of mass poisoning in South Africa, 67 vultures were found dead in Mpumalanga. In Limpopo in May, 50 African white-backed vultures, 14 Hooded vultures, one Cape vulture and one Tawny eagle were found poisoned. 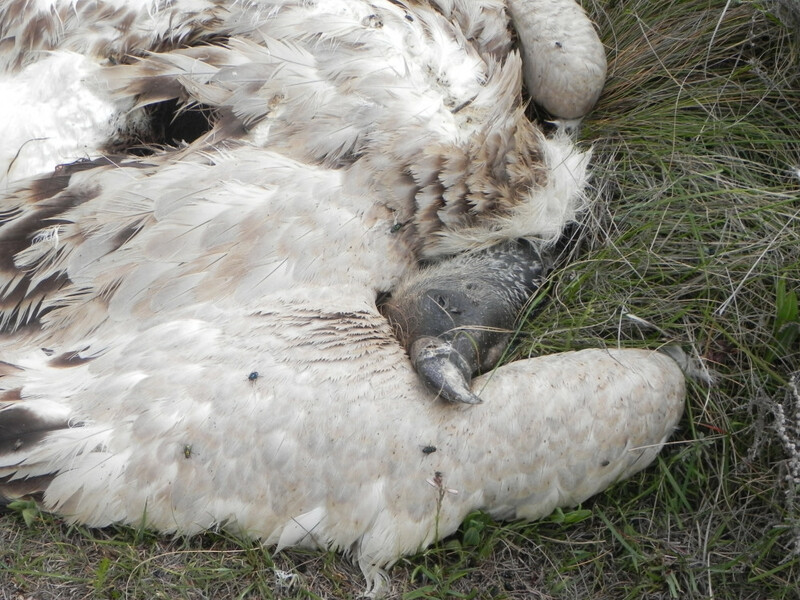 Kate Webster of the Cape Vulture in Crises organisation said poisoning has also caused large vulture losses in the Eastern Cape. Webster was searching for a “downed” bird with a tracking device in late 2013 when she came across 48 Cape vultures that had been poisoned. “Sadly the 48 counted were not the only birds dead as some must have flown some distance away before succumbing to the effects of the poison,” she said. The birds had been poisoned by a commercial farmer who used carborfuran, one of the most toxic carbamate pesticides, on two sheep carcasses. Vultures fed on these carcasses, with devastating results. Though there are more effective and targeted measures to protect livestock, farmers often resort to poison to deter so-called “problem” animals from attacking their livestock. While Wolter stresses that these farmers are the minority, the practice continues to occur, particularly among the younger and lazier farmers who want quick fixes to their problems. These farmers also lace the animal that was killed by the problem animal with poison and leave it out, with the intention that the problem animal will come to feed on the contaminated carcass. Problem or pest animals can be jackals, caracals, leopards, or even feral dogs. The problem with this method of control is that the “problem” animal is not the only one affected. Often, the problem animal does not even come to feed. Vultures, however, do come to feed and end up as a “by-product” of the target species. Depending on the quantity of contaminated carcass consumed, not all vultures will die at the scene of a poisoning. Some manage to fly back to their nest and feed their young, while others are found near water as a result of the poison that makes them severely dehydrated. Other times, bodies are just not found. More effective methods of control of problem animals include the incorporation of an Anatolian sheepdog into the livestock herd and kraaling the livestock at night. These are “greener” options that have had a very high success rate. An example of an indirect and unintentional form of poisoning of vultures is by hunters who use lead bullets for hunting game. While the influence of lead on vultures has never been quantified, it is known that the ingestion of lead bullet fragments is harmful to vultures (and other birds as well). Lead also affects the reproductive efficacy of vultures, which Wolter says could be a contributing factor to the low breeding numbers of vultures. Tim Snow, chief executive of the Wildlife Poisoning Prevention and Conflict Resolution, said the outfit had received reports of 197 poisoned vultures poisoned in South Africa between January and September 2015. “That is only what has been reported,” he said. Snow said hunters would use alternatives to lead bullets, but there had not been great pressure for them to do so. “What is of greater concern is the deliberate poisoning of a range of birds and animals,” he said. The South African Hunters and Game Conservation Association said traditional lead-based bullets constitute the bulk of the bullets produced for the market, with some availability of lead-free alternatives. “Whether the association will endorse the use of lead-free bullets only is a question which we will only be able to answer after we have completed the process and disseminated the information that is based on sound research,” said Johann van de Giessen, hunting manager at the association. Conservation organisations like VulPro and Cape Vulture in Crises are dedicated to protecting these important birds, but without any political will Wolter does not see the situation changing. “If we don’t make a concerted effort to safeguard the environment for these birds, we will be facing serious environmental imbalances in the near future which will ultimately have an impact on food production for an ever-increasingly hungry human population in South Africa,” Webster said.